We’re certainly in the midst of a very balmy autumn! There’s no excuse to not go out and enjoy the wonderful weather; why not go for a walk and revel in the changing colours? The leaves are only just starting to turn, so it’s not too late! Last week was a big week for Dr Luke, read below for more! There’s a lot happening in the clinic over the next few weeks, so scroll down to catch up on the clinic news and a yummy chestnut and butternut pumpkin soup recipe to warm up the evenings. Dr Luke has some exciting news after his recent trip to the Gold Coast for the Sports Chiropractic Symposium! At the symposium he was announced as the next President of Sports Chiropractic Australia which was a great honor and we are very proud of his achievement! And if Dr Luke wasn’t busy enough, after the Symposium he was busy attending meetings for 3 days as part of his role with the International Sports Chiropractic Association (FICS), which involved a number of Sports Chiropractors from all around the world. We are told Dr Luke eventually did enjoy some sun for a couple of days before returning back to clinic! This coming weekend it’s Dr Justin’s turn for further learning! He will be travelling to Sydney on 5-6th May as he attends the Gonstead Seminar. Dr Luke will be be working as usual whilst Justin is away. The Gonstead System is an integral part of what we do at Chiropractic Solutions and requires a lot of dedication to learn. Dr Luke will be away on May 19-20th as he travels to Sydney to teach other health practitioners all about assessing the runner. Dr Justin will be covering for the day. As part of Spinal Health Week 2018, we at Chiropractic Solutions are encouraging patients to make small lifestyle changes to improve your spinal health and wellbeing. Musculoskeletal conditions are very common, affecting 30% (6.9 million) of all Australians (including 3.7 million people with back problems). While in some cases this cannot be avoided (such as an accident or injury), everyday habits can be a big determining factor in how well your spine can handle stress. Spinal Health Week 2018 (21-27 May) is a great opportunity to focus attention on everyday habits which may harm the health of your spine. At Chiropractic Solutions, we are encouraging all our patients to take charge of their health and make the necessary changes to improve their quality of life. Simple lifestyle adjustments like being mindful of your posture, taking breaks from mobile devices, being active and incorporating stretching into your daily routine can make a noticeable difference. If you or anyone you know is experiencing spinal health issues such as back pain, neck pain or headaches, it is advisable to seek professional advice. 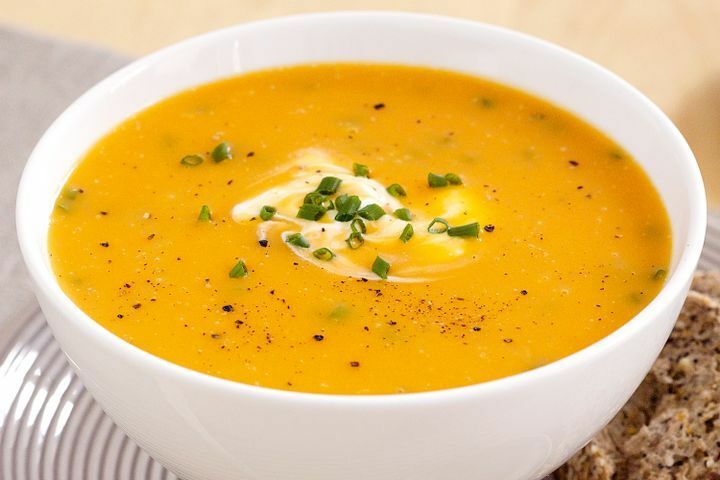 For a wonderful burst of autumnal flavour and colour this soup recipe is sure to please! Chestnuts and butternut pumpkin are both high sources of Vitamin C – just what is needed for this time of year – as well as magnesium and potassium amongst other vitamins and minerals. Gut health: How your weekly shop could be messing with your microbiome! Is it a coincidence that as the number of overprocessed foods in our supermarkets has grown, the diversity of microbes living in our gut has shrunk? ACL reconstructions up more than 70 per cent among young Australians, study finds. Sports Chiropractors are trained in the assessment & prevention of ACL injuries, call our clinic to find out more!